He knows no fear, he knows no danger, he knows nothing. Thank you for joining us this week Couchers! I hope you can join us again next week for some Behind Bars movies. Hope you had fun joining! Until next Tuesday Couchers! Take care and Happy TCP! Lol! It's also exactly the tag line that made me watch this film. At first I saw Rowan Atkinson I thought 'oh he's gone action' but when I read "... he knows nothing" I bought the DVD straightaway. Aga ng TCP ng host tomorrow na sa akin mami kikamz. 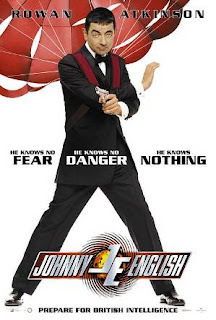 it's absolutely hilarious to watch johnny English! i kept falling off from my chair..LOL! this movie is hilarious. my daughter loved it. she likes mr. bean so much and so she enjoyed watching this movie.